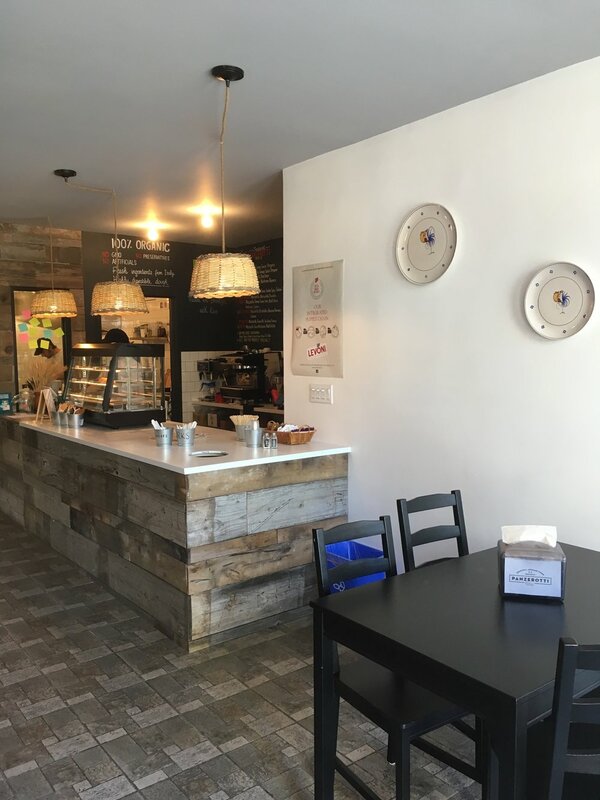 Panzerotti Bites – Seems like Carroll Gardens is going back to its Italian roots, with the addition of Roman Lillo and now Panzerotti Bites, purveyor of savory and sweet panzerotti, Apulian street food that looks like a calzone but is lighter and crisper. 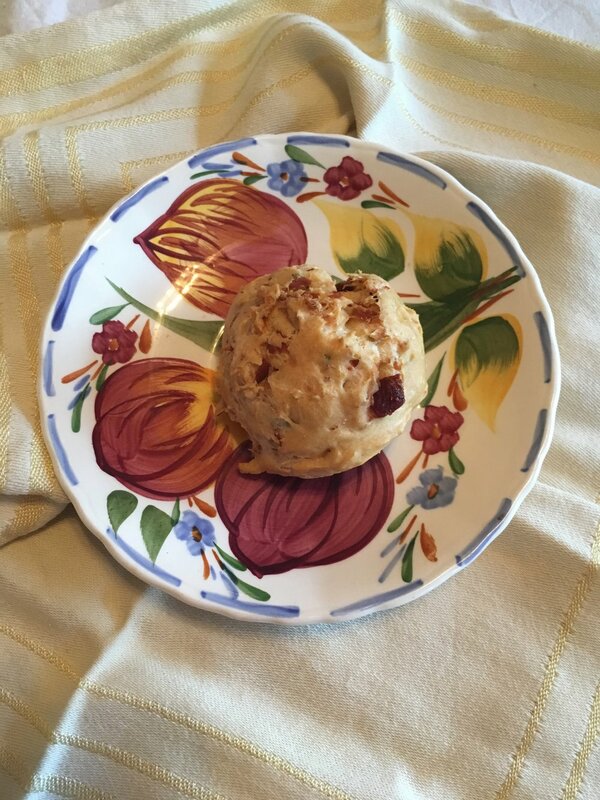 I loved my artichoke panzerotti with pureed artichoke, mozz and Pecorino Romano ($7.90). The owners hail from Bari, and posters and website offer strict instructions on “how to eat” (it actually does take four minutes to inhale aroma, wait for it to cool a little and then…mangia! Salumaria Rosi and Silver Moon Bakery– My friend Lydie alerted me to this stellar cheese puff specimen with generous chunks of prosciutto. They are stored in a large glass container at Salmueria Rosi, and what a steal at 60 cents! Buy three, and enjoy the nice pockets and hollows of this irregularly shaped puff. In contrast, I tried the cheese puff ($1.25) at stellar UWS bakery Silver Moon, and it was bland and characterless—quite a contrast to the cheesy, layered pogásca at Hungarian Pastry Shop, which is only 85 cents. Silver Moon does, however, make a wonderful Bavarian pretzel for $2.95. Slice this chewy concoction in half and layer it with ham and mustard. Giacomo Fine Foods – My friend Hilary was down in New York again and we met up during the March for Our Lives, when she told me how a wonderful small cup of tomato eggplant soup with a piece of baguette ($4.00) gave her the sustenance she needed to stand with other activists, clogged on a side street, waiting to enter into the march. I looked at the Yelp reviews for Giacomo, and people also seem to love the tomato basil soup and the sandwiches as well. ...And two instead of one! HMart -- and two new authentic Chinese restaurants, Grain House, and another Szechuan one just moving in on Columbus and 105th Street, are further evidence that the Asian student population of Columbia University is changing the culinary face of Morningside Heights. HMart is a Korean grocery chain, and what a thrill it was to wander the aisles—whole oodles of noodles, indecipherable packages of unrecognizable items. Among the prepared foods, I saw a “Korean pancake,” and thought I recognized the same vermicelli noodle stuffed scallion pancake that saved my marriage, documented in my first blog post. I brought it home, excited, warmed it up, and bit in only to find there were no vermicelli noodles inside (though on the ingredient list) and it was stuffed with a gooey sweet soy sauce mixture. Into the compost it went. 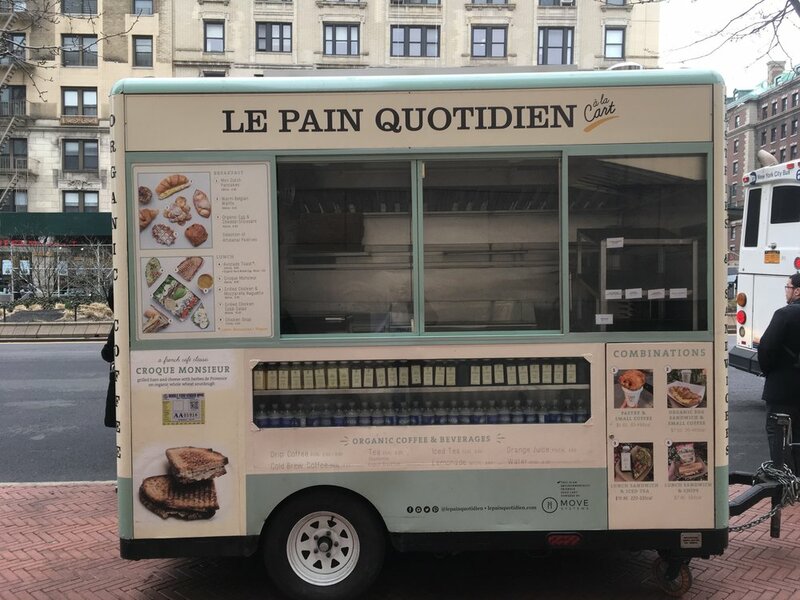 Le Pain Quotidien - Now I happen to think Le Pain Quotidien is a pain and quotidian and overpriced for what it offers, but I was amused to see this truck serving Avocado toast, mini Dutch pancakes ($4.95) and and a warm Belgian waffle ($3.50) to Columbia Students at the 116th entrance to College Walk. The breakfast items did not seem so overpriced as their store goods, but then again you don’t have those lovely farmhouse tables on which to eat your faux French food. Charlotte Patisserie and Dean & Deluca - Ran in to Charlotte to get my mother a miniature delicious crême brulée in a foil cup ($4.00), but saw that this stellar bakery has savories as well. Will be back! Meanwhile back in Manhattan Dean & Deluca offers some of the best biscuits north of the Mason-Dixon line. Ask them to heat either the cheddar jalopeño or the salted buttermilk up a little and get it with a pat of butter. If you sit at the counter facing Madison Avenue, you will have to avert your eyes from the private school girls sashaying by in their knee socks and the small well-dressed dogs to pretend you are down in old Virginny! 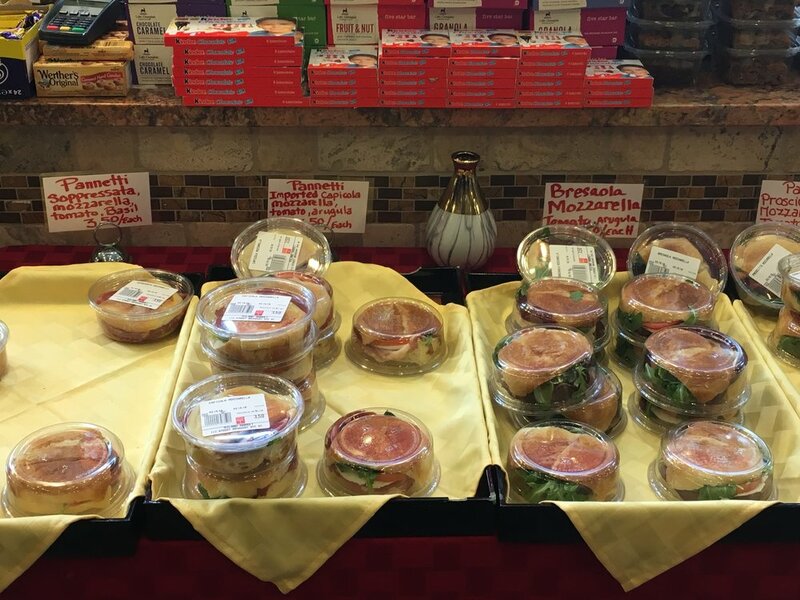 Milano Market – Our neighborhood Italian deli is where I get cans of good Italian tuna fish, small ciabatta loaves and mini mousse cakes to bring to dinner parties. So I was pleased to see these mini Milanese sandwiches on offer, “panetti,” stuffed into small plastic tubs for $3.50 each—ones with sopressata, mozzarella, tomato and basil, or imported capicola, mozz, tomato and arugula and variations with bresaola and prosciutto. Molto bene! PS. NYCSnackAttack is going to Norwich, UK for five weeks to be near the Chef’s mum and family and travel about. Watch for culinary dispatches from Blighty to appear soon!